We shouldn’t be mixing the level of service, quality of software, and changes in features and pricing as a reason to use or not use LinkedIn. OK, LinkedIn has taken us along for a ride, adding and removing features the platform used to have years ago and making it “news”. BUT – it would be silly and unproductive of us to walk away from the incredible pool of self-entered professional data. It’s just not an option. Besides, we may be getting an adequate search system back, after all! 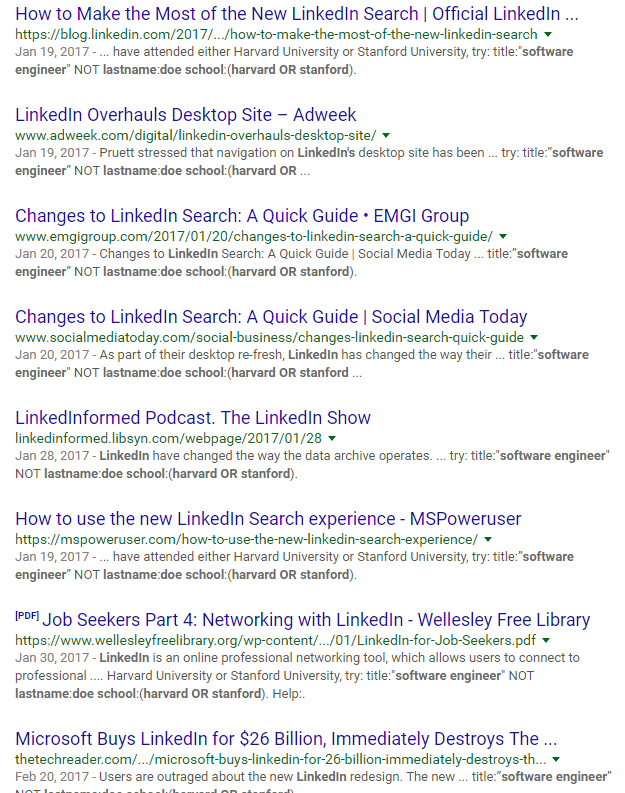 Apparently, it is hard not just for us, uninformed users, but for LinkedIn itself to ride through so many redesigns and individual roll-outs within such a short period. Let’s take a look at the screenshot above, which is THE guide for advanced searching at the moment. This syntax, as in the example, doesn’t work; please take a note of it. title:CMO OR title:”chief marketing” (correct, at the moment). 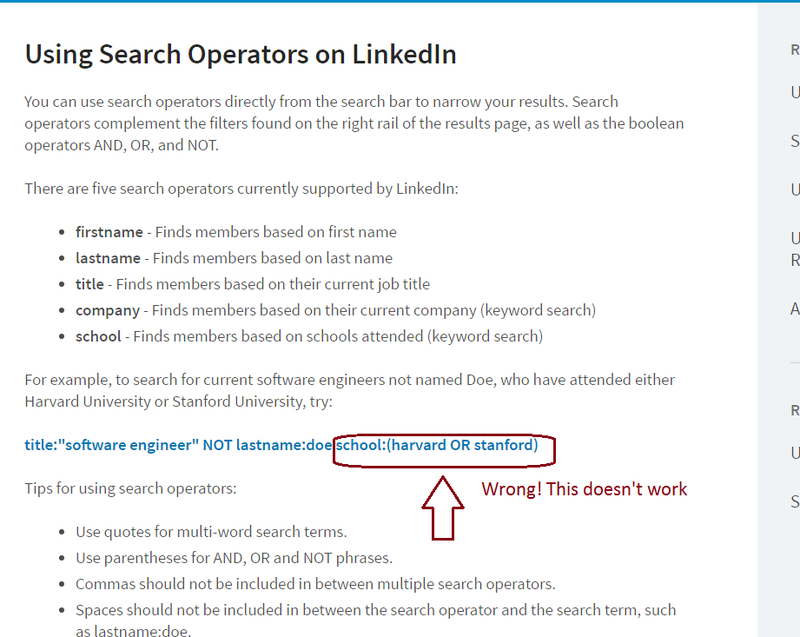 It would be nice if LinkedIn either implements the syntax it documents or fixes the tip sheet to reflect what it does. Agree? And here’s a new LinkedIn HACK for you. Step 2. Run a search for people – for example, this. Given that there are multiple UI versions out there and things are still in flux, this may or may not work for you- sounds like it does, for most! Tip. If you examine how we have changed the search URL to perform the job title search, you may come up with other “hacks” that will expand the search functionality. We will tell you how to work with and work around the newly redesigned LinkedIn in the upcoming webinar – Wednesday, March 15, optional practice Thursday March 16, 2017. Thanks for your latest LI hack. It worked great for me looking for CPA specialists. Just found your site. Great tips! The changes on LinkedIn only allows you to view three profiles if you’ve reached your max. I was very pleased with the amount of detail for me to utilize in more ways than one. good information. would love updates as they become available.